Co-conveners: Yanan Fang (Nanjing Institute of Geology and Paleontology), Paul Olsen (LDEO/Columbia University), Morgan Schaller (Rensselaer Polytechnic Institute), Jessica H. Whiteside (University of Southampton). Overview: An ICDP - EarthRates international workshop is being convened to develop a science plan and chart specific proposals for the Colorado Plateau Coring Project 2 (CPCP 2) and Early Mesozoic, low- to high-latitude Coring Transect (EMCT). The overarching goal of CPCP 2 / EMCT is to obtain a robust globally - exportable geochronology for the Late Triassic and Early Jurassic (237-174 Ma) that links together zircon U-Pb ages, paleomagnetic polarity, atmospheric gas concentrations, climate gradients, biotic change, and all major parameters of the orbital pacing of climate (precession, eccentricity, obliquity, inclination), that will be invaluable to the general scientific community. Background: Developed in the 1999, 2007, and 2009 ICDP-, NSF-, and DOSECC-funded workshops with over 100 participants from more than 11 countries, the Colorado Plateau Coring Project (CPCP) was designed as a focused coring program to address fundamental Earth System issues using the 100 million year venue of the continental Triassic-Jurassic strata on the Colorado Plateau and adjacent areas. These include fundamental questions of astrochronology and Solar System chaos, Pangean paleogeography, paleoclimate, and biotic evolution, and constraints on the processes responsible for and consequences of the end-Triassic mass extinction event, the Toarcian ocean anoxic event and Jurassic-Cretaceous biotic turnover events, and the resultant establishment of dinosaurian dominance. The 2009 workshop developed a plan for the ultimately successful NSF and ICDP proposals for Phase 1 of the CPCP - coring of the Triassic section at Petrified Forest National Park, with coring completed in late 2013. We now are primed for CPCP phase 2, which will likely involve coring the nearly complete Early Jurassic age section in the Colorado Plateau, including expression of both the end-Triassic mass extinction and the Toarcian event in the Colorado Plateau strata, with stratigraphic overlap with CPCP 1 stratigraphy. Progress in astrochronology, celestial mechanics, paleoclimate proxies, U-Pb geochronology, and paleomagnetics have compelling case can be made to pair the low-latitude Colorado Plateau site with a high-latitude, continental site. That paired project is called the Early Mesozoic, low- to high-latitude Coring Transect (EMCT) and will interface with the Early Jurassic Earth System & Timescale (JET) project in the UK. Above left: The paleo-Arctic (~70 degrees N), cyclical, coal and black shale-bearing, Late Triassic age Haojiagou Formation in the Junggar Basin, Xinjiang, NW China. Visible are 3+ laterally continuous cycles of lacustrine black and gray mudstone containing lake-ice-rafted-debris. Above right: The sub-tropical (~25 degrees N) fluvio-lacustrine zircon-bearing mudstones and sandstones of the Early Jurassic Kayenta Formation on the Colorado Plateau, AZ, USA. The Junggar Basin sequence, extending as an apparently continuous sequence from at least Norian of the Late Triassic through the Toarcian seems to record both obliquity- and precession-related orbital pacing of climate as would be predicted on the basis of its high latitude position, as well as abundant and well preserved floral remains, including abundant deciduous conifers. The Kayenta Formation is a red-bed sequence with abundant lacustrine beds producing a rich tetrapod assemblage that also has abundant datable zircon-producing mudstone intervals and a recoverable magnetic polarity record. The Kayenta Formation is part of the Glen Canyon Group that spans minimally the Hettangian to Toarcian (based on U-Pb geochronology) and which overlies the Late Triassic age Chinle Formation the lower 3/4 of which was cored by CPCP 1. The 4-day workshop will be held in St. George, Utah, May 11-14, 2019 to develop scientific and logistical plans for coring at low and high-latitudes and interesections with the JET project. The workshop will review the overall context of the scientific issues, focus on how selecting the optimal contextually driven locations for coring, articulation the primary and auxiliary scientific objectives, and establishment of collaboration and responsibilities, with an outcome that will establish a draft science plan to be used in producing specific funding proposals. 1) A single-page cv. that lists contact details, education and appointments, and key publications. 2) A single-page summary of your interests and intended contribution to the project. These should be in the form of a single PDF file that should be emailed email to the workshop organizer by February 1, 2019 (Paul Olsen, Lamont-Doherty Earth Observatory of Columbia, polsen@ldeo.columbia.edu). Selected participants will be informed by mid-February of financial support and costs will be covered as far as possible by workshop funds, with the cost of the optional fieldtrip to be covered by the participants. Preference will be given to scientists from ICDP member countries, early-career scientists, and to those whose expertise and interests complement that of project initiators. Participants can also be self-funded but must still prepare an application as indicated above. 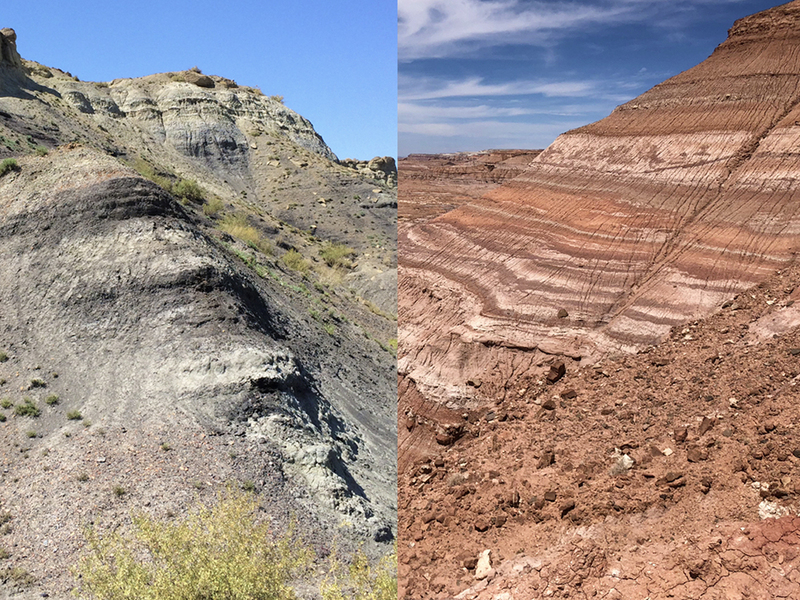 The post-meeting fieldtrip (May 15-16) will examine spectacular outcrops of largely continental Triassic-Jurassic transition sequences through Jurassic-Cretaceous sections on and around the Colorado Plateau, especially in the St. George, UT and Tuba City, AZ regions as presently planned. We will look at sites that exemplify the various units that provide critical time control both in terms of zircon U-Pb geochronology and lacustrine units potentially providing lithostratigraphic control. Participants should plan returning to St George, UT the evening of the 16th. You are invited to apply by 15 March 2019, and will be notified if your application is successful as soon as possible. Please contact Paul E. Olsen (polsen@ldeo.columbia.edu) with your expression of interest and CV. • Application deadline is March 15, 2019 (extended from February 15). Selected participants will be informed by the end of March of financial support and costs will be covered as far as possible by workshop funds, with the cost of the optional fieldtrip to be covered by the participants. Preference will be given to scientists from ICDP member countries, early-career scientists, and to those whose expertise and interests complement that of project initiators. Those not selected for ICDP or EarthRates support can nonetheless participate also but must still prepare an application as indicated above but must therefore be self-funded. Transportation and lodging arrangements are the responsibility of the participants. However, there will a block of rooms reserved at the to-be-determined hotel (announcement soon) in St. George until April 22, 2019. Selected participants should expect to be reimbursed by ICDP or EarthRates in a total amount to be determined. Symposium: The symposium will begin at 9:00 AM on May 11th at the Hilton Garden Inn and end on the evening of May 14th. Therefore if you are planning on just going on to the symposium, you should arrive on May 10. Fieldtrip departure and return locations: The field trip will depart from and return to Hilton Garden Inn at St. George early on the morning of May 15th (time to be determined) and return the evening of May 16). Driving time on the fieldtrip is considerable so plan accordingly. 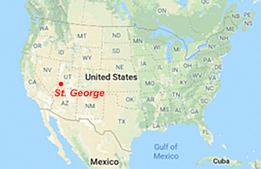 St. George: There are flights to St. George (SGU - airport code). Some participants may want to rent a car in some other major city within a few hours drive of Flagstaff and drive on their own. Las Vegas, Nevada, and Salt Lake City, Utah. 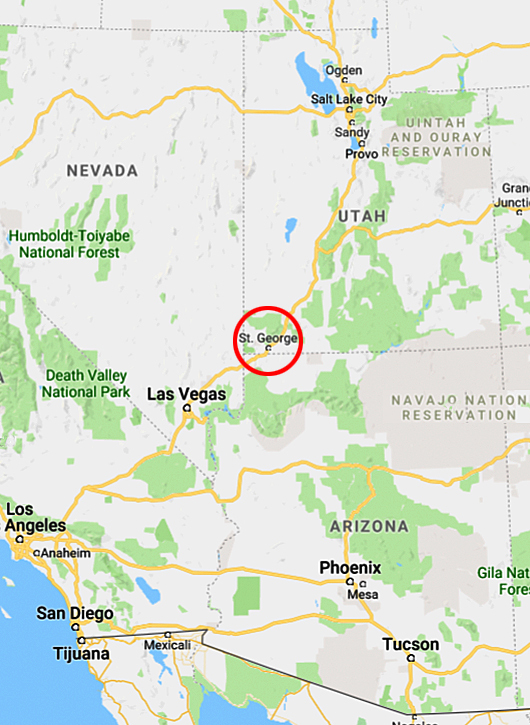 Map of United States with position of St. George, Utah. See regional map below (from GoogleEarth).